Fran and I are a team. Team Gum. That’s the starting point for pretty much everything we do, especially in the mental health arena. Our book. Our blog. Our social media presence. Podcasts. Interviews. Events. Book readings. Everything. There are no hard and fast rules for how we balance things between the two of us and with the many other aspects of our lives. It depends on the nature of the work itself, our individual skills, experience, and preferences. It also depends on our commitments, health, and whatever else may be going on in our lives at the time. I thought it would be interesting to take a look at how it all works for us. It is no secret that before I met Fran I had little knowledge or awareness of mental health. Fran had a lifetime’s worth which she shared, and continues to share, openly and honestly. Mania. Depression. Suicidality. Fatigue. Pain. Insomnia. The realities of living with chronic mental and physical health conditions. I learned from what Fran told me and by spending time with her every day. I also learned from the books I started reading, from courses and workshops, and by engaging with others. None of this means I really understand what it means to live with illness but I do believe it helps me set Fran’s lived experience, and that of others, in a broader context. And I have grown first-hand experience as a friend and caregiver. Fran worked as a highly successful electrical engineer before illness struck. She is technically competent which is a huge benefit, given that we live three thousand miles apart and do everything together online. I work in the technology services industry (but please don’t ask me to troubleshoot your laptop or printer!) and have a fair measure of web, graphics, and computing experience. I love the technical side of running our social media, website and blog. When either of us is away from home I take the lead in ensuring we can keep in touch. Fran is a far more natural writer than I am. She is also a keen and accomplished photographer. She took the portrait photographs for her book For the Love of Peaks: Island Portraits & Stories: A Collection. On the other hand Fran’s creativity depends a great deal on her health, energy and focus. The effect of illness on her motivation to create, her ability to do so, and the nature of her output (her writing in particular) can be profound. This is something we describe in our book. It makes it hard for Fran to work steadily at a project over a prolonged period of time. I am more methodical and structured when it comes to writing. These are valuable traits when working on a long term project like a book, or committing to a blogging schedule as I recently have with bpHope.com, but they come at a price. I struggle to connect with the creative flow, not least because I tend to self-edit as I write. It is something I continue to work with. For example, I am currently experimenting with writing my blog posts out longhand in one of my Midori notebooks and typing it up later for editing. Creativity aside, the tidal nature of Fran’s symptoms means she does not always have energy or focus to devote to projects. I provide the more or less stable structure to our work, keeping things moving forward so that Fran can contribute as and when she is able. As far as possible we schedule our work around Fran’s health, allowing time in between for rest and recovery. At least, that’s the theory. We don’t always get it right. 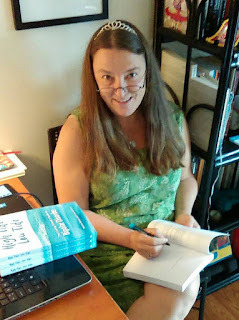 In the months leading up to our book’s publication we were working flat out with our publisher to get everything finished on time and to standard. I did most of the editing but each chapter, indeed every sentence, was proofread several times by us both. Fran was heavily involved at every stage including contract negotiations and book cover. She took a series of photographs which contributed greatly to the concept development, although they weren’t used in the final design. 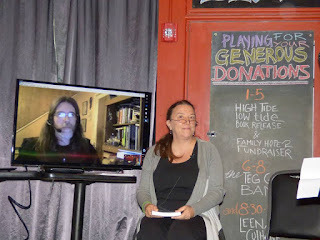 We had an online cover reveal, and a book launch which was hosted online by us both and in person by Fran. 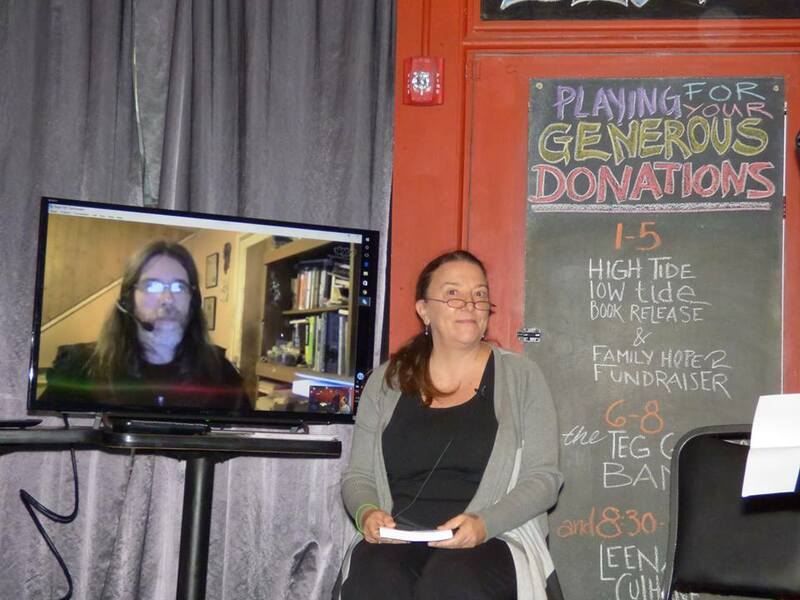 This was followed by a book reading and charity fundraiser at a venue in Portland, Maine. Almost all the physical work for that fell to Fran and she hosted the event, with me attending virtually on a big screen at her side via the magic of the internet. In addition to all this we arranged interviews and podcasts, and there were marketing and promotion leads to be followed up. It was the culmination of four years’ work. It was very rewarding but also exhausting and frustrating. It led ultimately to Fran getting severely fatigued and sick. She needed a prolonged period afterwards to recuperate. Early on, our mental health contacts were all on Fran’s side of the Atlantic. Mostly these comprised her professional support team and people she had met over the years. As Fran’s friend and caregiver I got to know, and be known by, many of these people and organisations. Maine Health. It Takes A Community. NAMI Maine. Family Hope. Over time we started connecting with mental health groups and individuals online. Many of these were also in the US, including Stigma Fighters and No Stigmas. 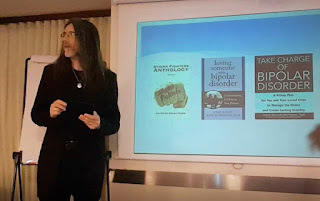 At some point I recognised that I needed to up my game and connect with the mental health community here in the UK. My first approach was to Time to Change, the UK-wide charity campaigning to end the stigma and discrimination associated with mental illness. It was one of my wisest moves, and led to me connecting with many wonderful folk. 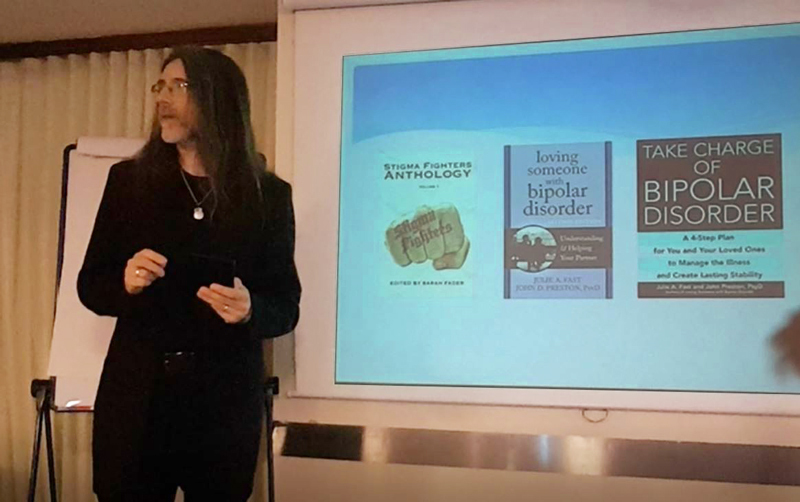 Much of our outreach is done online through social media but I have taken up the opportunity to attend events here in the north-east of England and further afield, including speaking at a mental health event last year in Ely. For someone who used to have no social life and little in the way of social skills (the two facts are not necessarily unrelated!) it is a wonder and a delight to me that my life has changed so much. It is interesting how our social skills complement each other. Fran is brilliant at meeting new people, which is a boon on vacations where she will strike up conversations with folk she has never met before. She finds it harder to maintain connections and friendships long-term. I have always felt more comfortable with established relationships, although I am learning to relish new connections and first time conversations. I have certainly “come out of my shell” to the extent that I now enjoy the people side of our work. Much of our motivation for working in the mental health area is to challenge stigma and discrimination, and to share the message that living with mental illness does not preclude or prevent deeply meaningful and mutually supportive relationships. The flip side of that coin is that stigma and discrimination really do exist and are rarely pretty. We risk negative reactions any and every time we raise our heads above the parapet. Every Facebook post, every open and honest conversation, may bring unwanted and unwarranted reaction. The risk falls more on Fran’s head than mine. She is the person living with illness. She is the one with the diagnoses, the one whose symptoms, behaviours, and situation are being described or explored. With very few exceptions I have felt listened to and supported when talking about our friendship, about our book and work together, and about other crisis events in my own life. Fran on the other hand has personal experience of harsh and stigmatising treatment at the hands of others, and we go out of our way to protect against that happening again. It is part of the reason I am more of the “public face” of Team Gum. A few years ago Fran and I spent some time coming up with vision and mission statements for our mental health work. VISION: Our vision is a world where no one is too far away to be cared for or to care. 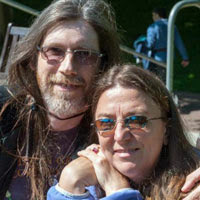 MISSION STATEMENT: To inspire connections between the ill and the well for a stronger more compassionate world. I recently changed my Twitter handle to include the words “#MentalHealth Author and Advocate.” This has brought me some negative feedback from people who see it as self-aggrandisement, or that I imagine I always know what to do or say to someone living with a mental health condition. Nothing could be further from the truth! I thought long and hard before claiming these labels. Doing so acknowledges how central our work has become to my sense of who I am and what I can contribute. No more, no less. Just about everything I do or am involved in is part of our joint commitment to effect positive change. If I often take the lead it is because I have fewer challenges to face, not because I am more committed or passionate about what we are doing. I am encouraged and supported by Fran at every step. We bring different things to the party and complement each other well. It is fascinating to me to witness how we have grown and learned from and with each other over the almost seven years we have been friends.